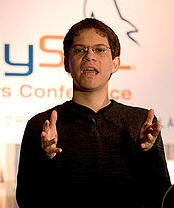 Miguel de Icaza is one of the most respected technologists in the industry, known for starting the Gnome and Mono projects. He is the CTO and co-founder of Xamarin and a genuinely nice person. Today we talk about Xamarin, Xamarin.Forms and mobile programming. This entry was posted in Essentials, Xamarin and tagged YapCast. Bookmark the permalink.